on engines today. The Positive Crankcase Ventilation (PCV) system is one that is very popular. 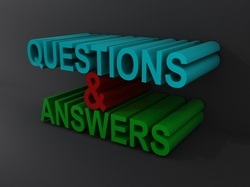 What is the PCV system, how does it work, and what type of pollution is being reduced? Answer: The positive crankcase ventilation system, referred to as the PCV system, was one of the first pollution control devices to be used on engines. Years ago, all engines had a “breather tube.” Its purpose was to remove crankcase vapors and gases from the engine. The breather tube allowed these vapors to go into the atmosphere as a known contributor to air pollution. Today, all engines use some variation of the positive crankcase ventilation system. The purpose of the PCV system is to stop crankcase vapors and gases, produced within the engine, from getting into the air. Crankcase vapors and gases in the engine are a result of piston blow-by. During combustion, a small amount of combustion vapors and gases pass by the piston rings and into the crankcase area. 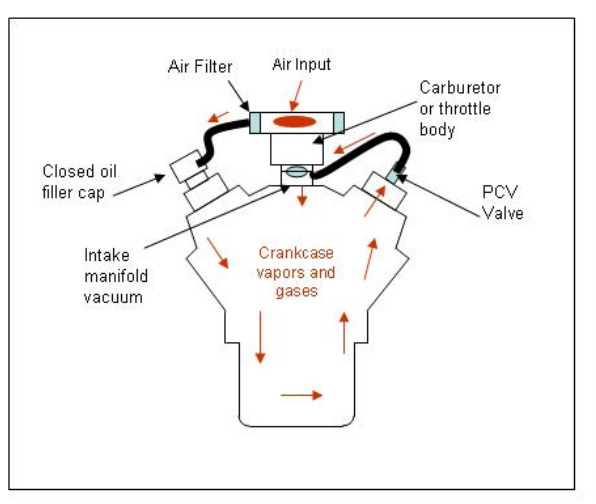 Referring to the illustration above, the crankcase vapors and gases are drawn into the intake of the engine by the intake manifold vacuum, to be further burned by the combustion. The PCV vacuum circuit works as follows. Air for the system enters the air cleaner area. The air then goes through the air filter, through a tube, and through the closed oil filler cap. The intake manifold vacuum then draws the crankcase vapors and gases back to the PCV valve. From the PCV valve, the vapors and gases are drawn into the intake of the engine to be burned by combustion. If too many vapors and gases get into the intake manifold, it may upset the air-fuel ratio. The PCV valve helps to control the amount of vapors and gases going back into the intake manifold. 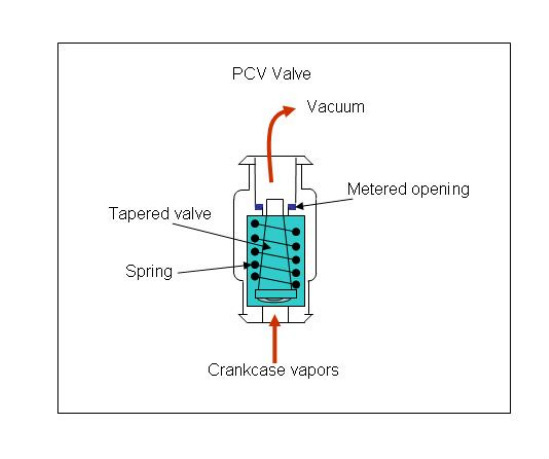 A typical PCV valve is shown in the illustration to the left. In operation, two forces are working against each other. Spring pressure inside the PCV valve works against the intake manifold vacuum. When the engine is stopped, no intake manifold vacuum exists. At this point, the PCV valve is moved down by the spring inside. When the engine is decelerating or at an idle, intake manifold is very high. The intake manifold vacuum lifts the PCV tapered valve upward against the spring pressure. This reduces the size of the metered opening. Under this condition, very little crankcase vapors or gases enter the intake manifold. During normal loads and speeds, the vacuum in the intake manifold drops. This allows the inside spring to push the plunger down which increases the metered opening on the top of the valve. Under this condition, the amount of crankcase ventilation vapors and gases going into the intake manifold increases. During acceleration or heavy loads, the intake manifold vacuum is very low. The inside spring now pushes the tapered metering valve further down, allowing more crankcase vapors and gases to enter the intake manifold. In summary, when the engine is at low speeds, only a small amount of crankcase vapors and gases are sent into the intake manifold. As the engine increases in speed and load, more and more crankcase vapors and gases are allowed to enter the intake manifold. The photo to the left shows a typical PCV valve used on most engines. 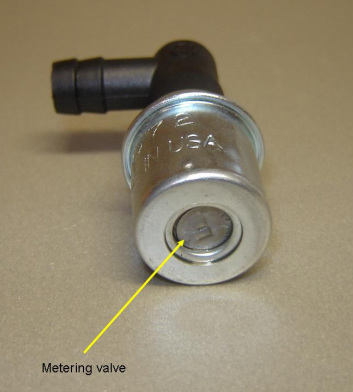 The arrow is pointing to the bottom of the metering valve. As mentioned above, when there is no intake manifold vacuum, the spring pushes the metering valve down. Even with the spring pressure, the valve doesn't go all the way down. If shaken back and forth, the PCV metering valve should rattle. If it doesn’t, it is most likely plugged and needs to be replaced.